The On-Stage Setup defines the ensemble’s stage layout and technical needs, including basic ‘backline’ needs, where that is being supplied. Note that an acoustic grand piano will be incorporated into the keyboard player’s setup if it’s available on-stage, but this is not an absolute requirement. Kalabash is always willing to participate in jazz workshops and instrument clinics. Many members of the ensemble are actively involved in teaching at university, college and primary and secondary school levels. Workshops can be conducted with the whole ensemble, or individual musicians can present workshops or clinics geared to a particular instrument. 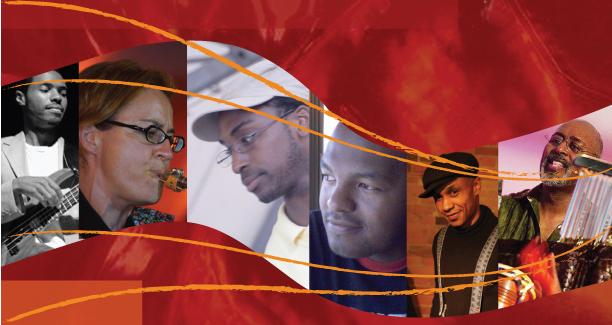 Click here for a summary of potential jazz workshop and instrument clinic areas. The bass player just happens to craft his own electric basses, and that has been added as a possible clinic as well. The Detailed Technical Specifications document defines the detailed technical rider needs and optional equipment list where applicable.